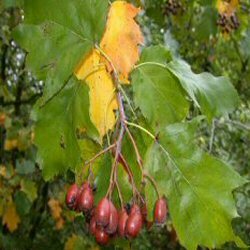 Buy Wild Service Tree (Sorbus torminalis) online from UK tree supplier of cell grown broadleaf hedges and shrubs. As a native, British tree, The Wild Service Tree (Sorbus torminalis) only made it to England. Considered to be one our most attractive native trees, interestingly, its fruit has in previous times been made into a drink, called 'chequers'. The tree itself is identifiable by its uprightbranches, which become less so with age and scaly bark. Expect a final height of 26m (86ft 8in). Typically, Wilde Service Tree is planted in groups of between 10 and 25 trees. This number of trees is ideal for creating a wildlife habitat and a meaningful source of food and shelter. Spacing may vary between 1m (3ft 4in) and 5m (16ft 8in). Blending of one species into another is suggested although bearing in mind different growth rates. The aim is to mimic what nature intended and thus avoid artificial lines. Wild Service Tree , is a native tree of importance in the landscape .